Welp, here we are. Another limited edition Oreo to review. I was originally going to skip this one on purpose because I thought it was going to be boring. Remember when I had those Blueberry Ice Cream Oreos from China? Those had a mentholated effect to recreate the coolness of ice cream mixed into the cookie. After trying those I didn't feel the need to taste America's version...until all my other foodie friends gave it a try and rated it so highly. Could I have been wrong? Was this cookie not a flop after all? I guess we'll see! This Oreo flavor is a Target exclusive product, so you can only find them in Target stores. (Which for me, was a lot easier to find than the Fruity Crisp which were only sold at Wegman's in my area.) This flavor uses a graham flavored cookie with a blueberry flavored creme and the package features a big ol' lattice-style blueberry pie. 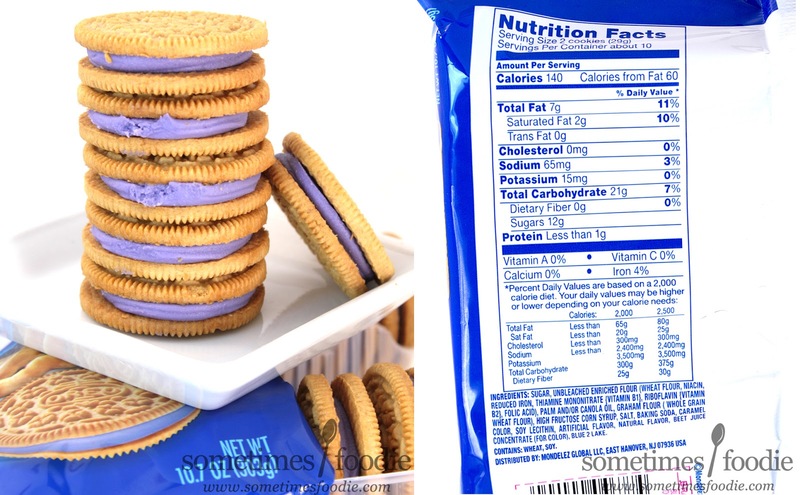 It looks delicious, but I'm skeptical that the Oreo will be evocative of actual blueberry pie. I mean, pie filling is bright and tangy, not creamy. 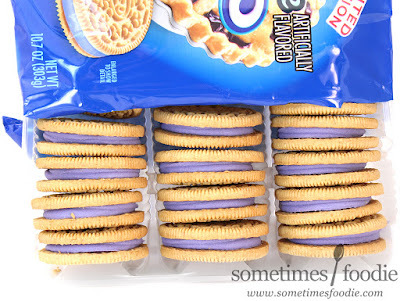 Maybe if this were a blueberry cheesecake Oreo I would have been more onboard, but pie filling being recreated by a creme? I'm not buying it. Just like the Fruity Crisp Oreos, this one doesn't have a specific way to open and reseal the package, which is pretty annoying. I grabbed some scissors and made a clean cut on the side, but once this review is over I'll have to go grab a ziploc bag and double bag these bad boys to fend off staleness. Once opened, the cookies inside smell a lot like animal crackers. It's not really a bold graham cracker aroma, more like a mellow version with a heavily dose of vanilla (like animal crackers). 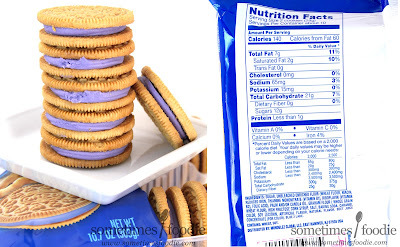 There's also a light blueberry scent, but it's very faint and easily overpowered by the cookie portion. 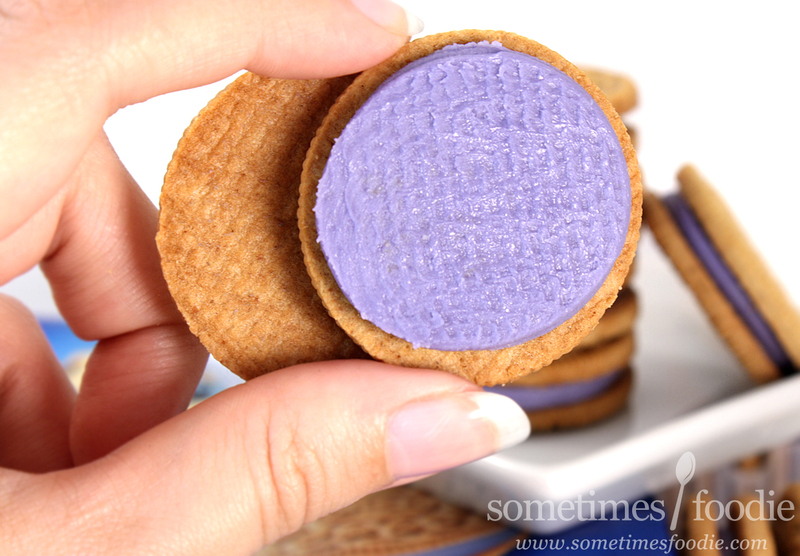 Twisted apart, the creme is a beautiful periwinkle color that's really beautiful and eye catching, but it makes me think of cosmetics, not really a color I'd expect my food to be. I tried the creme on it's own, like I usually do, and the flavoring doesn't remind me of blueberry pie, but it is very reminiscent of blueberry muffins, or Blueberry Morning. (My mother's favorite breakfast cereal.) There is a deeper berry flavoring than I expected, and it's pretty authentic, but the fruit flavoring isn't bright, jammy, and tangy like a pie filling. With that being said, I'm still more impressed than I thought I'd be. 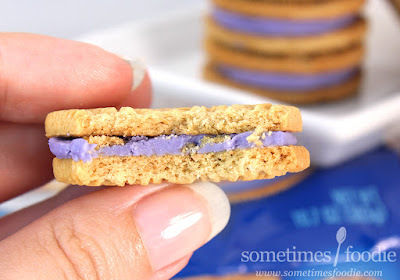 The blueberry flavoring is very enjoyable and something we don't often see in American sandwich cookies, and when you combine it with the graham cookie parts, it makes me think of breakfast. 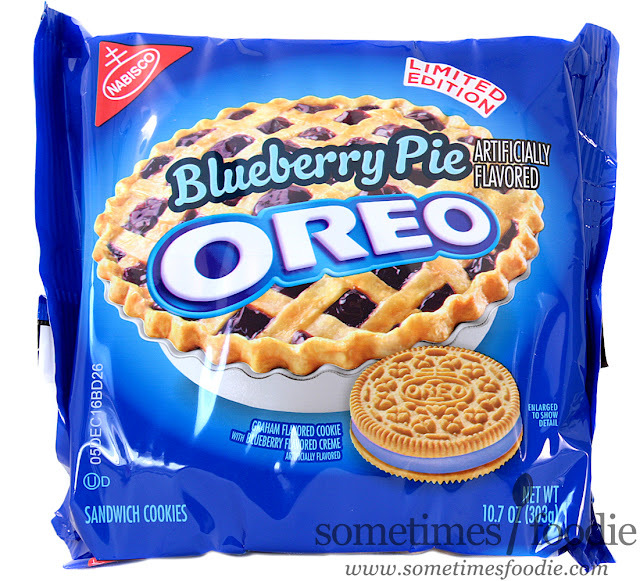 This is more similar to blueberry pancakes, waffles, muffins and other more dough-heavy blueberry baked goods, but pie? Not so much. UPDATE: Since my mother loves Blueberry Morning breakfast cereal I gave her some of these and she loved them. Too bad these are only sold at Target. Guess I'll be skipping this one. that makes me want to try them even more since i love blueberry pancakes and muffins, but not really pie.